One of the great surprises and changes on the map of Europe, with the end of the First World War, was the independence of Czechoslovakia. On October 28, 1918, the Czechs and Slovaks created Czechoslovakia, taking advantage of the break-up of the Austro-Hungarian Empire. They two peoples lived together for eight decades, before separating amiably in 1993. One of the main consequences of the Great War was the dissolution of the Austro-Hungarian Empire and the Ottoman Empire. Borders changed, and new states were established. This was also the case with Czechoslovakia. The new state owes its creation largely to a campaign carried out during the First World War by Tomas Garrigue Masaryk and Edvard Benes, later the first two becoming Czechoslovak presidents and the Franco-Slovak general Milan Rastislav Stefanik. The latter committed themselves to persuading the victors, France, the United Kingdom and the US, to support the establishment of their state. Tomas Masaryk had supported the independence of the Czechs and Slovaks since the beginning of the First World War, but already towards the end of the conflagration, he acted decisively to ensure the self-determination and ultimately the creation of a Czechoslovak state. He also considered that the best way of achieving this goal was by respecting Wilson’s points, especially the right of self-determination of each nationality: “The Austro-Hungarian Peoples, whose place among the nations we want secured and preserved, must be given the best opportunity for autonomous development”. In autumn 1918, the Dualist Monarchy was on the verge of collapse. 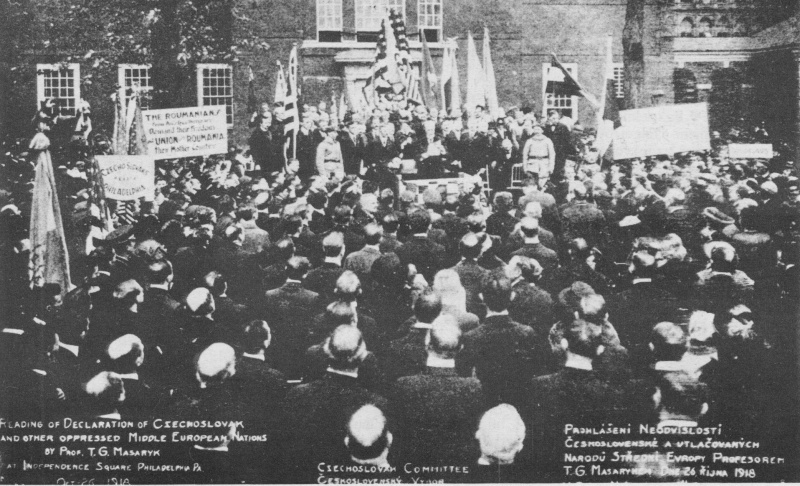 The defeat of Austro-Hungarian troops and their deplorable situation, as well as the destruction caused by the war in the Czech lands, contributed more and more to the desire of Czech politicians to secede and create an independent Czechoslovak state. Charles I of Austria, the last emperor of Austria-Hungary, observed this situation and did not try resist it, trying to limit the extent of the disaster. Through his minister for foreign affairs, Gyula Andrassy, he tried to appeal to the government of the United States by putting forth the willingness of the Viennese authorities to federalize the Dual Monarchy and organize it to ensure a large degree of autonomy to the peoples choosing to remain part of the empire. The measure was too late and of no consequence for Czech leaders. 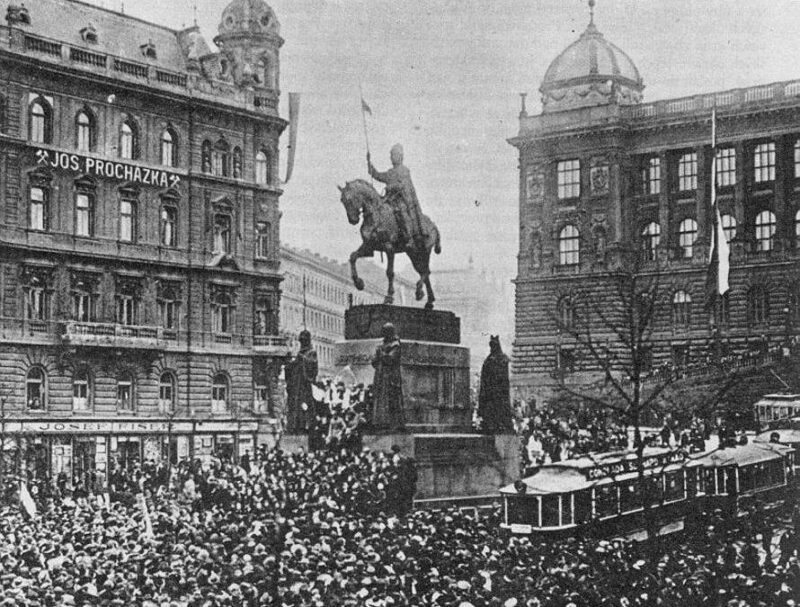 Following the official proclamation of Czechoslovakia by the Czech National Council, in Prague on October 28, 1918, the administrative authority of the lands belonging to the Czech Crown was relinquished. However, several military units remained faithful to the emperor and opposed the Czechs’ independence movement. The officers of the Prague Command barricaded themselves in the garrison building and finally surrendered after two day to the Czech National Committee. The commander in Litomerice followed suit and no longer supported the Viennese cabinet, which in turn confirmed the taking over of Czech territory by Czech politicians who had just declared Czechoslovakia’s independence from the Austro-Hungarian Empire. Two days later, on October 30, 1918, Slovak representatives confirmed in a statement adopted at Turciansky Svaty Martin the desire to live in a common state with the Czechs. The authorities in Budapest, which were in charge with the administration of these territories since the Compromise of 1867, was unable to block the action of Slovak leaders. First, the political and military situation of the Austro-Hungarian Empire was one that was approaching collapse, peace talks were a certainty as the defeat of the Central Powers was inching closer, and at the same time Budapest was following its own course, trying to cut its ties with Vienna. The attempt of Hungarian Prime Minister, Count Mihaly Karoly, to stop the Slovakians from seceding with the promise of greater autonomy in Hungary was rejected by Slovakian politicians. Its status as an independent country was recognized by the “Big Four” of the Entente at the 1919 Peace Conference in Paris. Negotiations then focused on determining the territorial boundaries in the former empire. The Czechoslovak delegation at this conference included Prime Minister Karl Kramar and Foreign Minister Eduard Benes. In the end, the Great Powers agreed with the territorial claims of the Czech lands in their historical form.